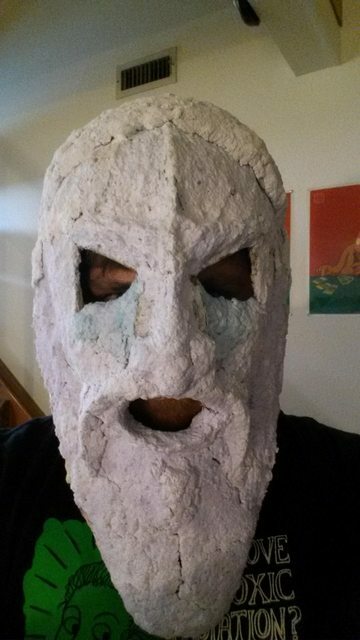 Last week, I discussed the inspiration and first few layers of my Greek Philosopher mask. This week, I will be showing a bit more of the build process. The process I used to make my Greek Philosopher mask is very similar to what was used in the Witch mask design. 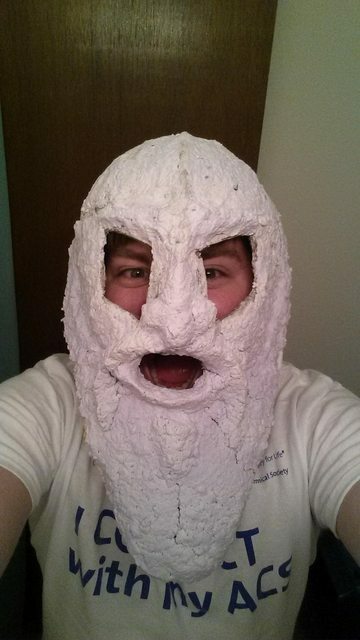 The bulk of the body of the mask was constructed from my special paper mache material composed of shredded and chopped paper, plaster of paris, PVA glue, and water. The material is layered on in a rather slow process, considering the lengthy drying times for the thick material. Between each layer, I coat the mask in Mod Podge PVA glue to provide extra strength. The Greek Philosopher mask is thickened with each layer, and elongated at the same time as the beard is constructed. The original holes cut for the eyes are over-expanded to give ample viewing room for the wearer and give room for a upper cheekbones. The nose is broadened from the cranial ridge from the first few layers. The cranial ridge is a design consideration to give additional strength to the build. A mouth is cut, and material is added to the edge to form the lips and mustache. The lips are flared outwards to mimic the shapes used in traditional Greek masks. This flared end is intended to increase the intensity of a sonorous voice for theater that predates many auditory enhancements we see today. 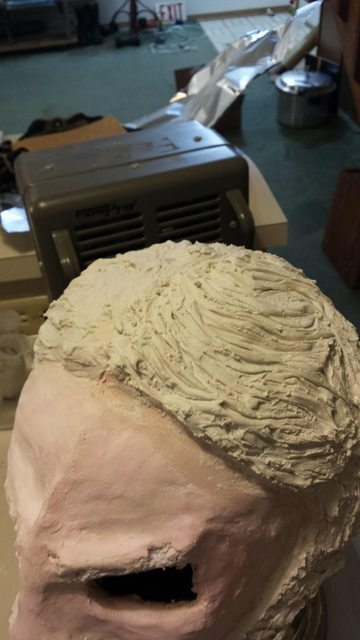 The top of the head is built up with more material to give the illusion of voluminous hair in the finished piece. The Greek Philosopher mask is given an intense demeanor with the shape of material added to the forehead and eye sockets. The mask’s character is given heavy eyebrows and deep-set cheekbones to that effect. The shape of the eyes is triangular to give a more threatening or admonishing tone to the character. Finally, the mask is built up in the manner which I want. 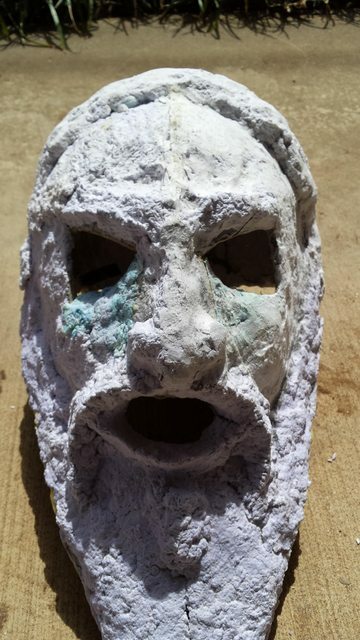 The surface is rough and oddly colored, but expression and characteristics for my Greek Philosopher mask are set. The next step is to sand out many off the imperfections to prepare for more detailed work. Since the material is composed of plaster, I would prefer not to inhale the dust. Sanding was performed outside on a day with an adequate breeze. After the mask was sanded, more material was added to coat the smoothed surface. This time, I used pure plaster of paris to form the more detailed and smooth bits. A watery mix of plaster was added to the face and beard, giving a smooth, finished look. The hair was constructed from a dryer plaster mix. Strands of hair were shaped with a nail from this more solid mixture. The Greek Philosopher mask was given wavy hair. Many of the original Greek masks have curled hair to fit with the traits of the people in the region, but I opted to not use that. The logic is that the character is a hoary old thinker with less concern for his appearance. 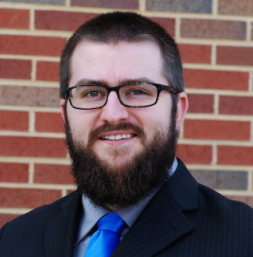 The weight of years of extra hair growth while consumed by meditation and thought would have naturally straightened the hair of the individual. Finally, everything was sanded down again with a finer grained sandpaper to prepare the surface for paint. 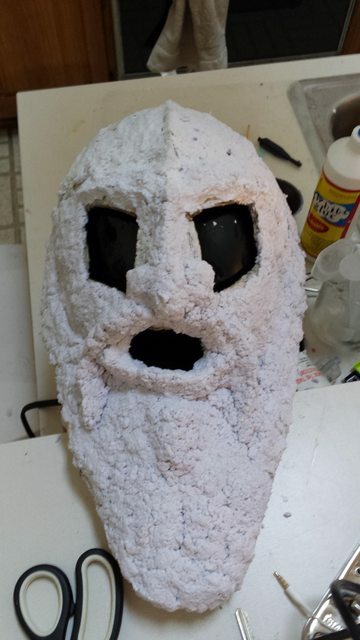 Next week, I will be showing the painting inspirations and methods to produce an appropriate look for the Greek Philosopher mask and finishing the build.